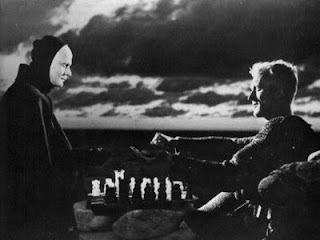 Remember the famous scene in Bergman’s The Seventh Seal in which the Knight (Max von Sydow) plays chess with death (Bengt Ekerot). You may remember that Woody Allen turned it to comic advantage in a famous New Yorker piece called “Death Knocks.” But imagine Donald Trump as the Knight and Vladimir Putin, Death. Of course, the piece Trump would be willing to sacrifice is The Crimea (“Trump to consider recognizing Russian Control of Crimea," USA Today, 7/31/16). What he would get in exchange is, of course, cooperation in wiping out ISIS. How this move is represented on the chessboard is another matter, but it’s reminiscent of Chamberlain’s famous quote, “The settlement of the Czechoslovakian problem, which has now been achieved is, in my view, only the prelude to a large settlement in which all Europe may find peace.” Trump is a true utilitarian. His solution is similar to that of the famous trolley problem in which you run over one person to save a larger group. Perhaps the attainment of the state of appeasement should be regarded as an achievement for such an otherwise unaccommodating personality. The USA Today piece went on to quote Trump as telling ABC’s This Week, “I’m gonna take a look at it. But you know, the people of Crimea, from what I’ve heard, would rather be with Russia than where they were. And you have to look at that, also.” Another way this grandmaster of life and death situations could have put it, is “you can’t please all of the people all of the time”—something apologists for Hitler were undoubtedly saying when he invaded the Sudetenland.